This spring loaded carbide wheeled cutter is specifically designed for glass mosaic work. The two carbide wheels each apply pressure from both sides. It's great for quickly making geometric pieces and random sizes. For all crafts, mosaic, tile & stained glass projects. 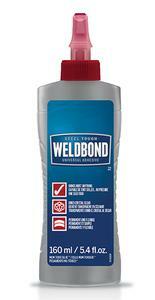 Weldbond is a multi-functional adhesive that bonds hundreds of materials. Weldbond it is a glue, a concrete hardener, and a bonding agent all in one. Certified by NASA for flight on space shuttles!